What to Read in Litchfield Prison: Dana Reinhardt on "We Are the Goldens"
If you like books that give you goosebumps and the shivers, check out the Edgar Awards nominees for the best in mysteries and thrillers. If you're looking for something to ward off the chilly weather (or to add another layer of chill), here are some of our favorite mysteries and thrillers from the past year. The Amazon Books editors recap a thrilling year for thrillers, and Seira Wilson talks to Markus Zusak about Bridge of Clay, his long-awaited follow-up to The Book Thief. Why we've waited so long to give Vannessa a voice on the blog is a mystery. Author A.J. Finn's debut novel is a thriller that we've loved all year long. 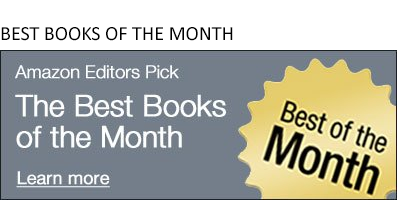 Here Finn talks about Alfred Hitchcock and other inspirations behind one of our picks for the top 10 best books of 2018. With a best-selling new novel, the fifth season of "Bosch" in production, and a new podcast on the horizon, it seemed like a good time to catch up with Michael Connelly. The only thing we like better than writing about books is talking about books. So we launched a podcast. We talked to bestselling author Tana French about her new mystery, the book she considered a game changer, and what she's thinking about next. There's something for everyone in October's Best Mysteries & Thrillers. Charlaine Harris Talks about Her Brand-New Heroine and "An Easy Death"
Charlaine Harris--author of the books that HBO's hugely popular True Blood was based on--launched a new series this month featuring a gun for hire in the former United States, a pair of Russians wizards, and a secret that lives within a very powerful bloodline. Read on for our interview with Harris about An Easy Death. J. R. Ward Lights Up a New Romantic Suspense Series with "Consumed"
Black Dagger Brotherhood author J. R. Ward talks about firefighters, her brand-new novel Consumed, and her passion for writing strong female characters. Here are our favorite Mysteries & Thrillers of September. Carlton Cuse: Creating a New Chapter with "Tom Clancy's Jack Ryan"
TV series creator Carlton Cuse talks about modernizing CIA analyst Jack Ryan to step up to today's challenges while staying true to Tom Clancy's vision in the first season of Tom Clancy's Jack Ryan. When Your Mother-in-Law is "The Other Woman"
Author Sandie Jones on writing her debut thriller.